Are we like frogs in boiling water? Adjusting to increasing discomfort until it’s too late to hop out? Most of us by now are used to cell phone conversations invading our ear space. I may not LIKE overhearing detailed medical or romantic problems while standing in line at the grocery store or even while sauntering down the sidewalk, but I am no longer as uncomfortable as I was a few years ago. I’ve gotten used to it. Is this a good thing or not? Are cell phones turning us into blabbing idiots and giving us cancer? Maybe we are already brain wave scrambled. I confess I answer phone calls in public sometimes too, but because I am quiet by nature, I try to sneak into an unoccupied nook (not a bathroom stall, I learned the hard way) and keep my voice down. Now what is taking me by increasingly unpleasant surprise is the cell-phone shuffle, the zigzagging around those walking, noses into texts and Facebook on their phones, totally unaware of surroundings. Which includes me and hundreds of others. I think it’s getting worse. In fact, almost every time I go somewhere now, I have to maneuver around several people with their heads down, headed straight for me or stopped right in the line of traffic or a doorway. All ages and types too, teenagers, businessmen and women, families, seniors. The ones who scare me the most are the young parents with strollers. It’s hard enough getting around them when they are not on phones, but when they are, they are like rogue missiles. And even when I am being watchful, amping up my vigilance and doing this dance, there are surprises. The other night at the movies a woman slammed into me from BEHIND. We were less than 30 seconds from filing out after the movie and she was already checking for messages, in the middle of a moving mob. To her credit, she did apologize. The implications of this are scary. What if we were escaping a fire? Would she still be reading texts? Frankly, if she stopped, she’d be trampled and deserve it. However those around her would not deserve to have their buns toasted. We’ve been warned about the dangers of texting and driving and it’s even illegal in some states. 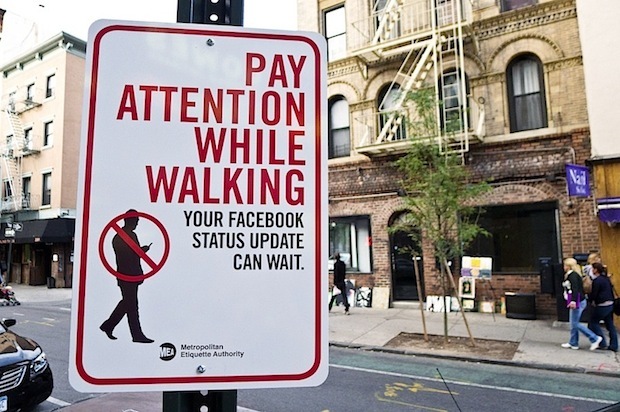 Maybe it’s time we thought more about the dangers of texting and walking, which are actually greater? Many studies point to an increase in pedestrian injuries and death due to cell phone use (talking and texting). Here in San Diego last Christmas, a young man plunged 60 feet to his death off our oceanfront cliffs while using his phone. A few months earlier a texting teenager was killed stepping off a curb into a truck. In Florida a woman walked into a train but survived, getting clipped. She was fortunate. Others have hurt or killed themselves by falling off platforms, or into manholes and fountains. Some cities are putting “bumpers” around lampposts. School and colleges are hanging signs in stairways reminding students to look up. Apple is working on making screens transparent so we can see ahead of us while looking at the phone. All these could be helpful, but they don’t really solve the problem of not paying attention, of being considerate of those around us. Why should it be something we adjust to? Is it time to hop out of the hot pot while we still can? It’s not just the inconvenience, it is also the financial implications. More accidents increase insurance rates for everyone. Bumpers don’t go around lampposts for free. Taxpayers will be picking up the costs of all kinds of things. PS. I am sitting as I type this.